I became interested in women’s travel writing of the Romantic period entirely by accident during the course of my PhD research. 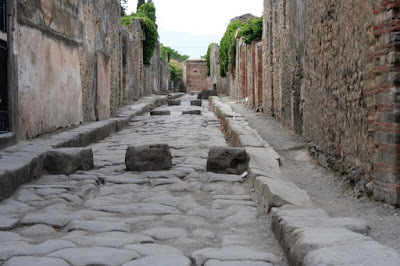 Part of my doctoral thesis explores the link between depictions of abandoned cities in Romantic Last Man literature and contemporary accounts of visits to the newly-rediscovered cities of Pompeii and Herculaneum. What fascinated me about these travel accounts was the way in which Pompeii and Herculaneum are not presented as ruins in the traditional sense; rather, they are described by early nineteenth-century tourists as appearing to have been only recently abandoned, Mary Celeste-style. Just as the Last Man wanders around deserted cities encountering half-eaten meals in people’s homes, so, too, did contemporary visitors to the sites come across chilling scenes of abandoned domesticity. The moral tales in the Lady’s Magazine form a distinct genre that consists of short, often illustrated, didactic stories intended to convey a lesson or moral to the reader. One might imagine that such a genre communicates a consistent or coherent ideology, but the fictional content of the moral tale varies widely in both instructive message and writing style – even in works by the same author. The prolific correspondent ‘R—.’ contributed moral tales for well over a decade, penning stories such as ‘Surgi, or the Stoic’ (LM IV [April 1773]: 193), ‘The Unexpected Meeting’ (LM IV [May 1773]: 233) – which takes place in Margate –, ‘Alphonso; or the Cruel Husband’ (LM V [April 1774]: 183), ‘Celadon and Florella; or the Perils of a Tete-a-tete’ (LM V [February 1773]: 65), ‘Penelope, or Matrimonial Constancy’ (LM V [September 1774]: 457) and ‘The Unwary Sleeper’ (LM V [May 1774]: 233). 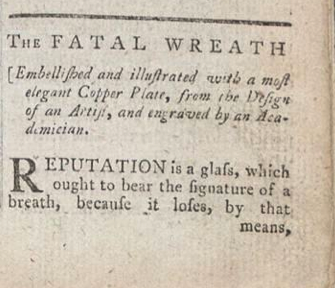 All of these tales have accompanying engravings and ‘R—.’ also contributed essays, opinion pieces, and serial fiction. This year, facilitating the Romantic Illustration Network has taught me three things: be ready shift furniture and sweep floors at 9am in your best conference jacket; never underestimate the importance of the well-timed tea break; and the most important work is often done in the pub after the symposium, so always choose a good watering-hole and book a large table. It’s been a great pleasure developing the Network and getting to know the regulars and the new faces who attend each event. I’ve become familiar with the inside workings of the British Academy, the Tate, and the House of Illustration, and I now have a really good sense of the goals and constraints of what are often loosely termed ‘heritage organisations’. It’s exciting to see, particularly after our recent event on Saturday June 6th, how our convivial gatherings, individual research papers, and gallery tours are actually building towards an understanding of shared interests and emerging research questions. Intellectually the awareness of a shared agenda and new theoretical approaches is growing, and alongside this, there is now a real sense of the Network as a collaborative international team of scholars. I hope we can continue to build on this. I wrote this blog in April for BARS (the British Association for Romantic Studies). I am very pleased to be part of their blog writing team, and very thankful to their support of my research: I have just recently been awarded a Stephen Copley Postgraduate Research Award to help fund an upcoming research trip to the USA. On 13th April 2015 I visited Newcastle University to attend a Research Symposium in the School of English Literature, Language and Linguistics (SELLL). This event, organised by Will Bowers, began with two panels of presentations by Newcastle researchers and a poetry reading, all of which paid specific attention to William Godwin, Percy and Mary Shelley and their circles. This was followed in the evening by the literature visiting speaker programme, with talks by Elizabeth Denlinger (New York Public Library) and Gregory Dart (University College London). Their talks focussed on ‘Editing Romantic-Period Writings in the 21st Century’.